The phylloxera heat shed at Naracoorte was the first purpose-built facility in South Australia for treating vineyard machinery to ensure that it is free from phylloxera. 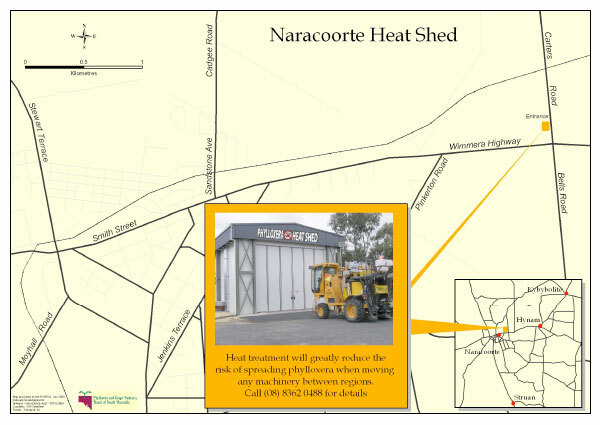 An initiative of the Limestone Coast Phylloxera Committee, the Heat Shed was constructed by Vinehealth Australia and the Naracoorte-Lucindale Council, with additional financial assistance from regional grapegrower groups, regional councils, the South Australian government and the Australian Government under its Regional Partnership Program. Machinery and equipment used in vineyards, in particular, grape harvesters, are at high risk of spreading phylloxera, because they often harbour grapevine material or soil and are especially hard to clean. The only way to ensure that machinery is free of phylloxera is to ‘bake it’ in a heat shed at required time and temperature specifications. Strict hygiene requirements apply for the movement of all machinery and equipment (including harvesters) between phylloxera management zones and between States. You must refer to relevant State quarantine regulations before moving any machinery and equipment. 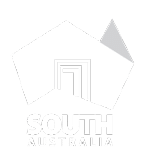 Best practice also means heat-treating machinery and equipment working between wine regions within South Australia, as a region could have an infestation of phylloxera for several years before any symptoms are seen. Costs are based on per treatment, including GST. To make a booking, please contact Sunbird Viticulture – Heat Shed Manager, on 0429 430 641. If you would like to become an accredited user, please complete the Registration of Interest Form below or contact Vinehealth Australia. One of the most effective deterrents against the spread of phylloxera into a vineyard is a washdown facility. This enables machinery to be cleaned to remove all dirt and plant material before entering the vineyard, which greatly reduces the risk of introducing phylloxera (or other soil-borne pests, diseases and weeds) into the vineyard. In response to grower requests, Vinehealth Australia has commissioned an engineering firm to develop detailed specifications for vineyard wash-down facilities. These contain sufficient information for a building application to be made to local councils. There are two plans, to take into account different vineyard sizes. Includes two options, one for vineyards where a washdown can be located away from vines (uses rolled metal as the base) and the other for vineyards where waste cannot be effectively disposed away form vines (uses a concrete slab draining to settling pits). For very large vineyards or for installation as a public facility for the use of contractors, transporters, growers, etc. Includes high use of recycling and filtering systems to reduce maintenance costs.